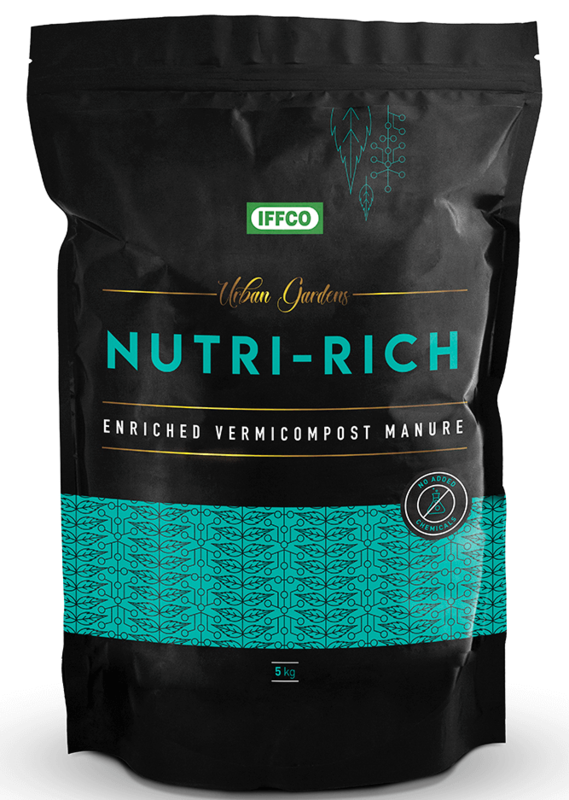 is a premium Vermicompost manufactured at a state-of-the-art facility with a patented process that turns pure cow dung into ensuring a standardized product adhering to global quality standards. It is an active biological mixture of bacteria, enzymes and is rich in bio-available plant nutrients such as concentrated nitrates, phosphorus, magnesium, potassium and calcium. Apart from this it also contains seaweed nutrition which protects the plant from abiotic stress. Enriches soil with beneficial microorganisms. Improves soil quality and structure. Helps plant achieve luxurious growth. Make 1-inch layer of Nutri-Rich over the soil in the pot and mix up with the help of a small shovel. 500 gm of Nutri-Rich is recommended for 3 kg of soil.